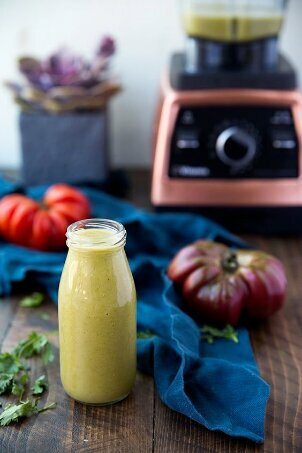 This Paleo Green Chili Sauce is perfect for everything from omelets to enchiladas and it even makes a great salad dressing for my Green Chile Salad with Shredded Chicken. To control the thickness of the sauce, simply add or reduce the amount of broth you use! Green Chili is one of my favorites because it reminds me of my Dad’s Green Chili Enchiladas that he used to make for us when we were a kid. This version is delicious, paleo and even Whole30 compliant! Heat a pan over medium high heat and add avocado oil after a minute or two. Allow oil to heat up and add chopped onion. Sauté for a few minutes until translucent and add the garlic in the center of the pan with a drop more oil. Saute for another minute and then add the chiles, without their liquid, the jalepeno, cumin and salt. Add pepper and onion mixture to your high speed blender. Pour in liquid reserved from chiles, lime juice, cilantro and broth. Blend on low, working your way up to a higher speed, until fully combined. If you’re using it as a sauce, use right away when it’s warm. 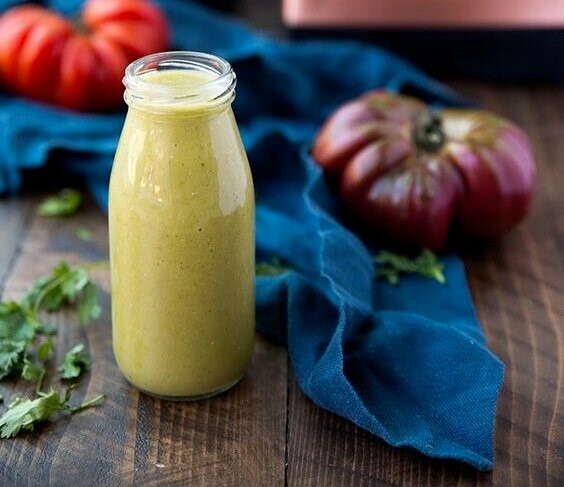 If you’re using it as a salad dressing, place it into a jar and let it cool in the fridge until you're ready to use it. Hi there Anya. Thank you for the Disclosure. I felt so excited for you when I read that you had received a Vitamix Pro 750 from Vitamix as compensation. Excuse my ignorance but what does it look like? I guess it is a high speed blender? Enjoy and thank you for the Paleo Green Chili Sauce. I am going to make it – soon.